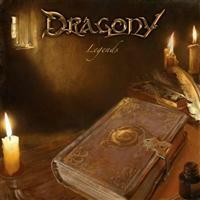 Austrian band DRAGONY started out as THE DRAGONSLAYER PROJECT in 2007. The nucleus of guitarists Daniel Stockinger and Andreas Poppernitsch plus vocalist Siegfrid Samer was soon augmented by more musicians. Opening for bands like AXXIS, FIREWIND and SONATA ARCTICA saw them add on drummer Frederic Brunner, keyboard player Georg Lorentz and bass man Herbert Glos. In early 2011 they changed names into DRAGONY, which was probably a wise move. The album was finished late last year, including guests like Ralf Scheepers of PRIMAL FEAR, Tom Tieber of ECLIPTICA and Katie Joanne of SIREN´S CRY. Mika Jussila did the mastering at Finnvox Studios and the band seems aimed at future glory, the info citing similarities to SABATON, EDGUY, KAMELOT…or? The pompous opener “Of Legends…” has a classic touch, but not much more can be developed during 1.29. Their believed ace “Burning Skies” features Ralf Scheepers but doesn´t really ignite to the full. There is force and falsetto for starters, but it is too archetypal for me. The first half of the album is the most bragged about in the info, but I find it strangely tame. “Dragonslayer” is the first that slightly raises my eyebrows. A simple basic beat has been enforced as power metal meets AOR and comes out with rings of MANOWAR and SABATON. The occasional duet “Vaults of Heaven” is a welcome change but the best songs are yet to come. The second part of the album sees the band mixing in elements of what sounds like MAGNUM in their heyday to me and going slightly softer. That formula seems the best to me as they are more convincing in songs like the slightly orchestrated “The Longest Night”, the power metal drummed but highly melodic “Hero´s Return” and their finest but, alas, final stand in the closer “Alcador”. The closing track is what I would love MAGNUM to do on their next album! A piano intro is followed by a mighty fine guitar pattern and it all evolves into a well-constructed epic that could have been longer than 6.27. As a whole DRAGONY would do wisely to skip the KAI HANSEN-tinged early eighties speedy power metal ideas in favor of more epic structures, which they have shown that they master…only in too small doses here.